Safariland Top Gun Level I Duty Holster - Model 200 FREE SHIPPING! have many duty holsters to choose from. The model 200 is a standard duty holster and a Safariland best seller. The Top Gun's top draw, mid-ride, straight drop cant and thumb break with one-way directional snap are familiar to police officers everywhere. An adjustable holster tensioning device on the Safariland 200, allows you to control the level of retention by simply turning a screw. 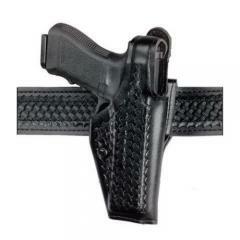 Always liked this brand and style of holster. I've had my Glock 21 riding in one on my duty belt for over 10 years and it still works and looks great. Thanks for having them in stock and I referred a friend to you who is also looking for one for his Glock 19 as I was. You were the only place who had them in stock Thanks again. Fits like a glove. I am extremely happy with the holster. Great holster. I prefer level I because a thumb break is all you need. Faster "break in" period than my last Top Gun holster for a smooth, unrestricted draw. Standard Safariland high quality and performance. Just the holster I wanted for my Commander. Good fit although tight at first. Takes some work to brake in. Quality item at a good price. ©2002-2019 CopsPlus.com: Safariland Top Gun Level I Duty Holster - Model 200 FREE SHIPPING!